Not many people have the opportunity to live their dream life every day. From knife throwing to acrobatics, to Fosse and back flips, Sam Lips has found his corner of the sky through Pippin: The Musical. 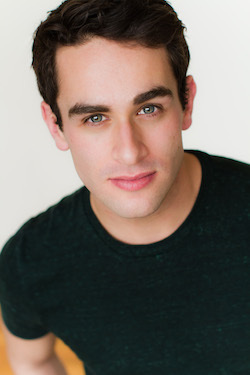 Dance Informa was fortunate enough to speak with Mr. Lips about playing the role of Pippin, how he stays healthy while on tour, and what audiences can expect from the revival version of the show. The Pippin revival is not your typical revival. The creative team, including Director Diane Paulus and Choreographer Chet Walker, have completely amped up the show to include acrobatics and circus elements featuring Les 7 Doigts de la main. 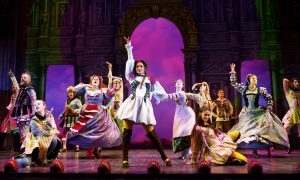 Still with the original music and lyrics by Stephen Schwartz and Fosse style choreography, the show stays true to its nature, but is no longer as “70’s” as the original. Pippin is fresh and new for audiences today. “I think they envisioned [the show] so beautifully for this day and age. With the acrobatics and sort of circus atmosphere, I think it’s so smart to cater to contemporary audiences,” Lips said. Sam Lips from the Broadway tour of ‘Pippin’. Photo courtesy of Lips. One thing Lips would like to take from the character Pippin and apply to his own life is his ability to brush off what other people think. “[Pippin] has this ability to put blinders on. He doesn’t really look sideways. As I play Pippin every night, I try to bring that into my own life as Sam…to just go for whatever I’m doing and not care about what other people think,” he said. One exciting aspect of Pippin on tour is the incredible set. Lips said that the biggest secret to the set and floor that travels with the tour is that there is not a lot of space behind the tent. He says that most of the crossings backstage are a bit choreographed. “You have to make sure that you don’t get hit by moving set pieces coming on stage. There is definitely choreography happening backstage as well as on stage,” Lips remarked. The floor and tent are not the only things that take a beating while touring. Performing day after day on the road for anyone can be tough on your body and your mind. Sleep and getting in the right headspace are key factors according to Lips. As well as Sam Lips, Sasha Allen and the original Pippin, John Rubinstein, audiences can expect a fun and extravagant night full of acrobatics, Fosse flair, vocals beyond compare, and to possibly leave with something a little deeper. See ‘Pippin’ from April 21 through late August, as the glorious four-time 2013 Tony Award-winning production travels across the country in its first national tour. Visit www.pippinthemusical.com for more information. Photo (top): The Cast of the National Touring Production of PIPPIN. Photo by Terry Shapira.